Explanation: This digitally processed and composited picture creatively compares two famous eclipses in one; the total lunar eclipse (left) of January 31, and the total solar eclipse of August 21, 2017. The Moon appears near mid-totality in both the back-to-back total eclipses. In the lunar eclipse, its surface remains faintly illuminated in Earth's dark reddened shadow. But in the solar eclipse the Moon is in silhouette against the Sun's bright disk, where the otherwise dark lunar surface is just visible due to earthshine. Also seen in the lunar-aligned image pair are faint stars in the night sky surrounding the eclipsed Moon. Stunning details of prominences and coronal streamers surround the eclipsed Sun. The total phase of the Great American Eclipse of August 21 lasted about 2 minutes or less for locations along the Moon's shadow path. From planet Earth's night side, totality for the Super Blue Blood Moon of January 31 lasted well over an hour. Incredible. It shows us how much our moon can change just with a few orbital positions. Either way. Great picture. Its both great things combined! The two eclipses are related elements, and combined exhibit a certain creative aspect of photography, but the events are so disparate that it isn't very exciting. The language is way over the top too, it is not a great American eclipse, it is a great eclipse that was visible over America (or the US), and the reference to 'Super Blue Blood Moon', is also superfluous and gratuitous, super blue blood? who are you trying to appeal to? If we used a lunar calendar, there wouldn't even be such a thing as a blue moon, it is just hype; the eclipse is a significant event, it doesn't help to throw in useless language. Hype doesn't belong in science. dr.tucson wrote: Hype doesn't belong in science. But this isn't science. It's a social event and it's science popularization. <<In Chinese philosophy, yin and yang (陰陽 yīnyáng, lit. "dark-bright", "negative-positive") describe how seemingly opposite or contrary forces may actually be complementary, interconnected, and interdependent in the natural world, and how they may give rise to each other as they interrelate to one another. Many tangible dualities (such as light and dark, fire and water, expanding and contracting) are thought of as physical manifestations of the duality symbolized by yin and yang. This duality lies at the origins of many branches of classical Chinese science and philosophy, as well as being a primary guideline of traditional Chinese medicine, and a central principle of different forms of Chinese martial arts and exercise, such as baguazhang, taijiquan (t'ai chi), and qigong (Chi Kung), as well as appearing in the pages of the I Ching. 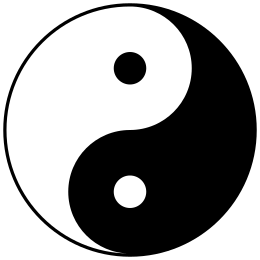 Duality is found in many belief systems, but yin and yang are parts of a Oneness that is also equated with the Tao. The term 'dualistic-monism' or dialectical monism has been coined in an attempt to express this fruitful paradox of simultaneous unity/duality. Yin and yang can be thought of as complementary (rather than opposing) forces that interact to form a dynamic system in which the whole is greater than the assembled parts. Everything has both yin and yang aspects (for instance, shadow cannot exist without light). Either of the two major aspects may manifest more strongly in a particular object, depending on the criterion of the observation. The yin yang (i.e. taijitu symbol) shows a balance between two opposites with a portion of the opposite element in each section. "Hype" does NOT belong in Science.... that is why NEWSPAPERS ARE NOT SCIENCE!!! Nice image, kind of a strange idea. This is the first image I've seen where it seemed as though the prominences were highly correlated with the coronal outflows. It makes some sense. Both would be caused, I think, by expanding magnetic flux lines*, and probably the same magnetic field activity is causing both. *okay, I'm out of my depth quickly on this subject. I'm "hand-waving". dr.tucson wrote: The two eclipses are related elements, and combined exhibit a certain creative aspect of photography, but the events are so disparate that it isn't very exciting. The language is way over the top too, it is not a great American eclipse, it is a great eclipse that was visible over America (or the US), and the reference to 'Super Blue Blood Moon', is also superfluous and gratuitous, super blue blood? who are you trying to appeal to? If we used a lunar calendar, there wouldn't even be such a thing as a blue moon, it is just hype; the eclipse is a significant event, it doesn't help to throw in useless language. It smells a bit like astrology and marketing too. Why make up all this silliness about names, when there are all kinds of awesome, physically real phenomena to be interested in? The most awesome things in the universe have pretty boring names, and if you just think about it for a second, they're inherently awesome. Getting excited like this for lame numerological coincidences and common occurrences is probably just going to make people associate everything in the sky with hollow hype.